A four-stage programme for parents and families looking to introduce a dog into their home for the therapeutic and practical benefits that can be brought to a child with autism, including development of communication skills and toilet training. Based on first-hand knowledge, the programme was created through the successful experience the author had bringing up two children at opposite ends of the autism spectrum. This guide is comprehensive and highly practical, with case examples, tips and advice throughout. It covers all aspects of responsible ownership and training of the dog as a companion dog, and it provides tips throughout the dog's entire life cycle. Accessible for families and professionals alike, this innovative programme can have a huge impact on the life of children with disabilities. I read this book in record time as my daughter has autism and we have gotten her a dog that we will train as her service dog. This book gave me insight into how you go about having a dog trained and learned more a little about others who need a service dog too. Sometimes we think that not everyone needs one but for those who have children who are on the spectrum really do need one. My daughter's dog has made a change in my daughter already and we will soon get her trained to where she can go with us on vacations to help with her anxiety. 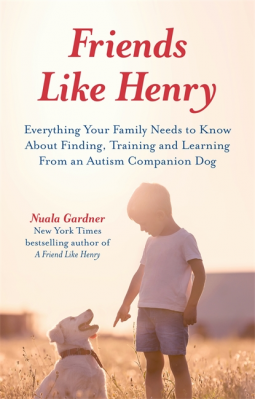 I recommend this book to those who have children who are Autistic and need a companion.